Discover the 4 Steps to Effective Communication and why it's so effective in your DISC practice. Combining these 4 steps with DISC tools will enhance your ability to deliver DISC to your clients and employees. We build these 4 Steps to Effective Communication in our DISC reports, and training materials. Step 1 is to understand what D, I, S and C personality types mean. Step 2 is learning to identify your own DISC style. How would you increase self-awareness of how you prefer to behave or do things? In addition to self-awareness, learn how others see your behaviors. Step 3 is a strength of the DISC Model. Learn to identify the main DISC style of others. Lastly, Step 4 is to modify your own behaviors to improve interaction and communication. While 99% of us are a combination of DISC styles, we look at each of the 4 DISC styles in its 100% form to help us learn about them. The key things to remember before we go into each style is that no style is better or worse. We share similarities and we have differences between the DISC styles. We all have strengths and areas of development. 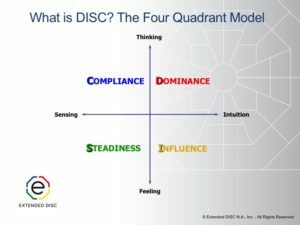 Introduce the DISC 4 Quadrant Model. Each quadrant represents one DISC style. Whenever I used the words "model" or "diamond" think of it as a map. Where the person is graphed on the map tells you his or her DISC style. You can choose to use the one word descriptors or the D, I, S, and C letters to represent each DISC style. The DISC Diamond model is a tool for observing and analyzing behaviors. A simple way to explain it is how we prefer to do things. 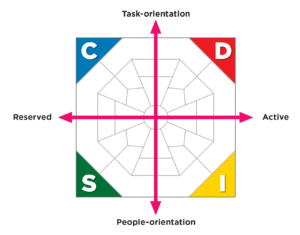 The Diamond takes the DISC 4 Quadrant Model to the next level by creating sections of each quadrant to better identify a person's DISC style. We have all styles. Everyone of us has D, I, S, and C. The DISC test tells us which of the DISC styles come naturally and which of the DISC styles take energy and focus. The DISC test is not about your ability, but about which behaviors you feel are natural to you and which are not. Any style can be successful. Leaders come from all styles. Regardless of style, we find that the most successful people are those that are confidently self-aware. They can observe, assess, and recognize . Once they can do that they can modify their behavior to improve communication and success. D-styles are task-oriented and active. They are focused on accomplishments. They are tough, decisive, and independent. When they are under pressure they can show a lack of concern and appear insensitive. Their biggest fear is loss of control. D-styles like to be large and in charge. Some examples of D-style would be Donald Trump, Hilary Clinton, and Simon Cowell of American Idol. I-Styles are active and people-oriented. They never meet a stranger. Every interaction is an opportunity to socialize. I-styles are sociable, talkative, optimistic, and persuasive. Under pressure the I-style can become disorganized. They can be so concerned about people and feeling that details fall through the cracks. I-styles fear social rejection. They never want to be on the outside looking in Some examples of I-styles are Robin Williams, Kate Hudson, and Goldie Hawn. S-styles are people-oriented and reserved. They like people, but prefer people to know. S-styles are all about relationships. They are amiable, good listeners, model, and trustworthy. Under pressure S-styles can be too willing and overly accommodating. They prefer secure and stable environments. Some examples are Tom Hanks and Princess Kate. C-styles are task-oriented and reserved. They like to analyze tasks and things. C-styles are disciplined, rule followers, and formal. Under pressure they can become overly critical and get bogged down by analysis paralysis. C-styles fear criticism of their work because they believe in high quality work. They can be self-critical because they set high standards for themselves. Some examples are Sheldon Cooper of Big Bang Theory and Hermione of Harry Potter. Step 2 is becoming more aware of our DISC behavioral style. This is a good place to provide your clients and employees with their Extended DISC Assessment now that they have a clearer understanding of what is DISC. DISC does not classify people into good or bad or better or worse. There are no right or wrong results, but the questions are forced-choice. Your DISC profile is based on self-evaluation. The results do not limit a person’s ability to develop in another direction or work environment. The test does not measure intelligence, skills, abilities or attitudes. The focus is strictly on how a person prefers to do things or his or her natural behavioral style. Step 2 in the report provides you with information about your DISC style including the profiles 1 and 2 and where your style shows up on the Extended DISC Diamond. The DISC report focuses your natural style which is reflected 95% of the report. If we know how we tend to behave and also how we tend to become more of our style under pressure then we have a base point for making the appropriate modifications to our style. If you need a quick refresher on reading the profiles, check out the Interpreting DISC Profiles webinar. Now that we've identified our own style, the next step is to identify the styles of others so that you can make the most effective adjustments. Your self-awareness and changes will improve your ability to interact with others and produce more positive outcomes. 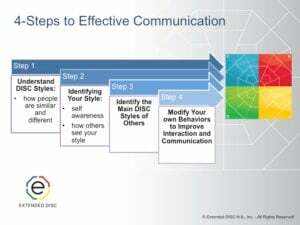 In the third step of 4 Steps to Effective Communication we learn to identify the primary styles of others. One of the strengths of the DISC model is the simplicity in which you only need to identify 4 primary styles. This is a skill that takes practice, but is easy to learn. Use the OAR acronym as a reminder to observe, assess, and recognize. When observing, listen to what others talk about, how they say things, tone of voice, and body language. Each DISC style has specific things they prefer to talk about. For example, the D-style prefers to talk about goals, results, and change. The S-style prefers to talk about the team and agreements whereas, the C-style prefers data and facts. Then you move on to assessing. Is the person is more reserved or active and is he or she more task-oriented or people-oriented? Finally, based on your observations and assessment you can recognize with DISC quadrant the person most likely falls into. We have reached the final step in the 4 Steps to Effective Communication. First, we need to understand that self-awareness is a gift. We accept who we are and we are responsible for our own behaviors. We can choose or not choose to modify our behaviors. What we can't do is to change others. We can only control ourselves. You simply have to understand what drives people and recognize your options for dealing with them. Consider interacting with people they way they prefer to interact. Locate the tips sections in your DISC report. These tips are specific to the person's styles and will improve interactions with other DISC styles. Think about these tips when you are interacting with others and how these behaviors don't come naturally to you. You need to concentrate and focus on changing. For example, if you are an S-style and interacting with a D-style, you need to remember to be concise and direct in your statements. We all have preferred ways of doing things, but we need to move to more effective situational behaviors at times. How do we move outside our behavioral comfort zone and find the behaviors that are better suited to specific roles and situations? If we know our natural style, then we have a base point for making proactive modifications. Thus, practicing or thinking about better ways to behave in different roles can benefit our track to success. We understand that, within our jobs, we are responsible for things outside our comfort zone. Can we recognize and adjust our style? When we practice behaviors repetitively we can get to a point where they become more comfortable and drain less energy. The goal here is to move towards learned behaviors or ones that, though not natural, are more natural-like. Ultimately, what we are trying to develop is a strategic communication response. When we understand our natural style, how we prefer to behave and how we show up under pressure then we are able to proactively make effective adjustments. The 4 Steps to Effective Communication is built into our Facilitator's Guide which shows you how to deliver a DISC workshop. We also have the 4 Steps to Effective Communication Workbook. Lastly, remember our DISC reports are built on the 4 Steps to Effective Communication. Using the DISC tools, while understanding the 4 Steps to Effective Communication, will create a strong and highly effective delivery of DISC to your employees and clients.